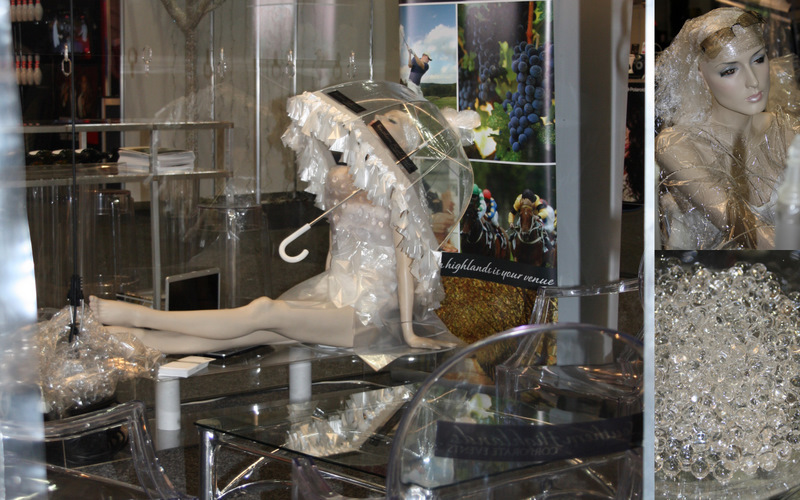 Styling Magazine by Coty Farquhar - Australia: My Southern Highlands Corporate Events design and display at the RSVP Events Expo at Darling Harbour, Sydney 2011 ........ 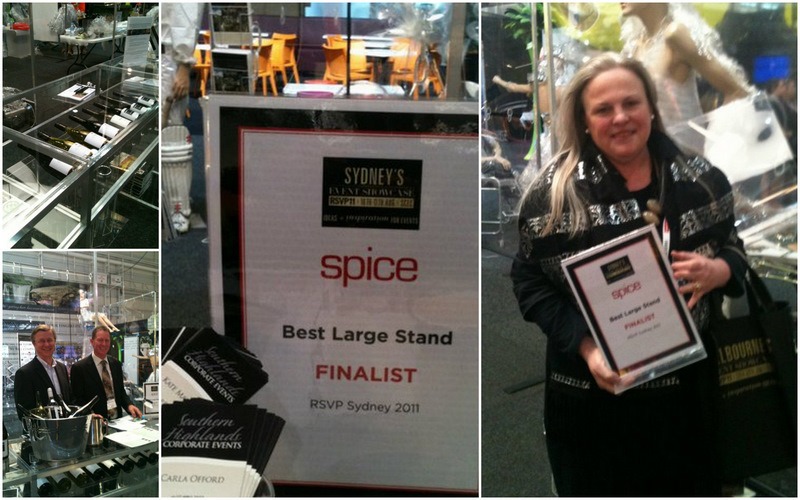 Nominated for Best Large Display!! 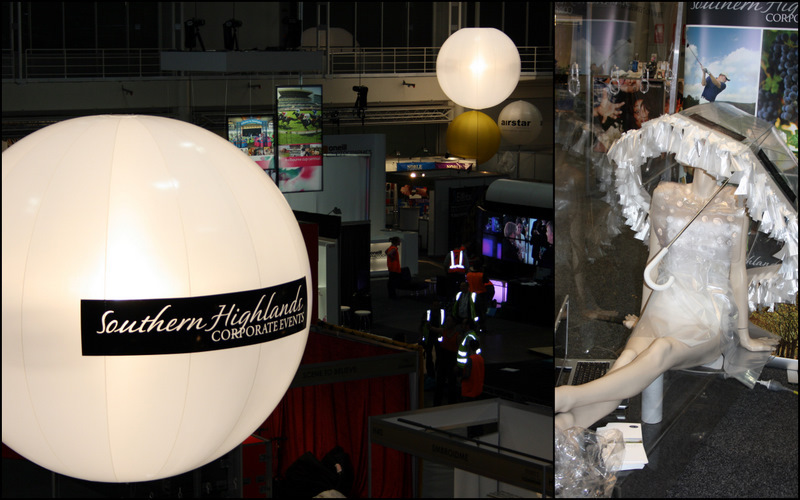 My Southern Highlands Corporate Events design and display at the RSVP Events Expo at Darling Harbour, Sydney 2011 ........ Nominated for Best Large Display!! Hi Everyone!! I know have been away for a while, well, away from my blog. The last three months have been very unusual for me, trying to plan my days and weeks was quite simply impossible. A little like having a new born baby, every time I planned something, someone would need me. It is great to be needed!! but you have to let go of some favourite things to survive, thus my blogging time was not to be mine. The good news is....Spring is here (in Australia), it's lovely and warm today, the air smells beautiful, the birds are back in my garden frolicking in the blossom trees and it's time for a wonderful big Spring clean in my life. 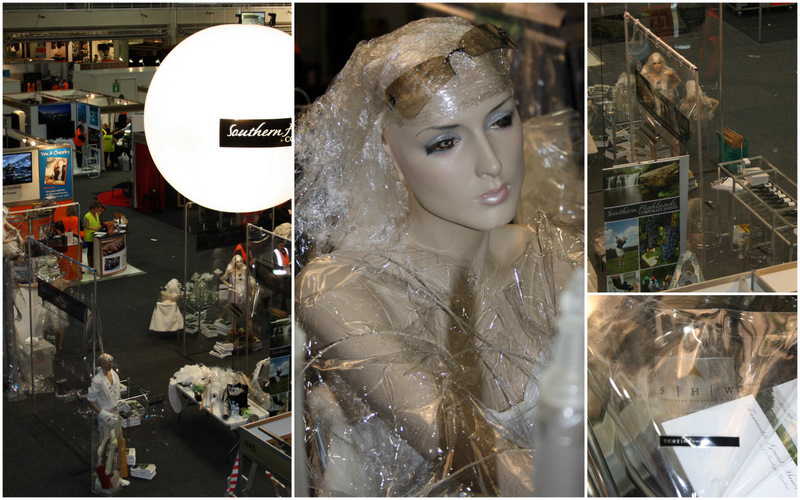 As promised, here is my display at the RSVP Expo at Darling Harbour this month in Sydney. 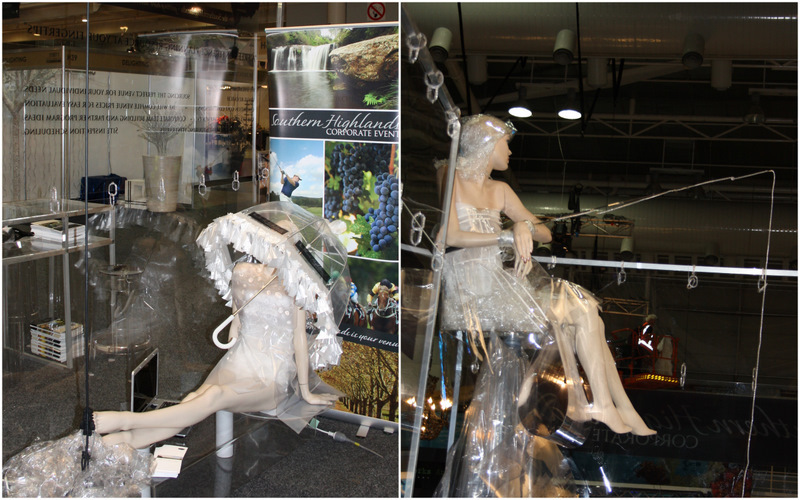 Last year I designed, styled and produced a display for my client, SHCE...Southern Highlands Corporate Events and I won best display for a small stand, so this year.....they went bigger...much bigger!! and ....I was again nominated for best "Large" display, however this year I came second, congratulations to Decorative Events who came first. 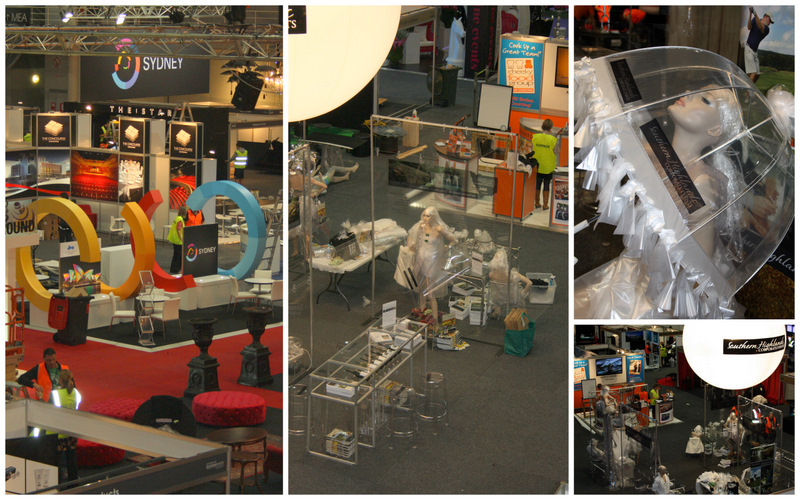 I designed the style of the stand last year and it took me well over a month to prepare, produce and make everything. 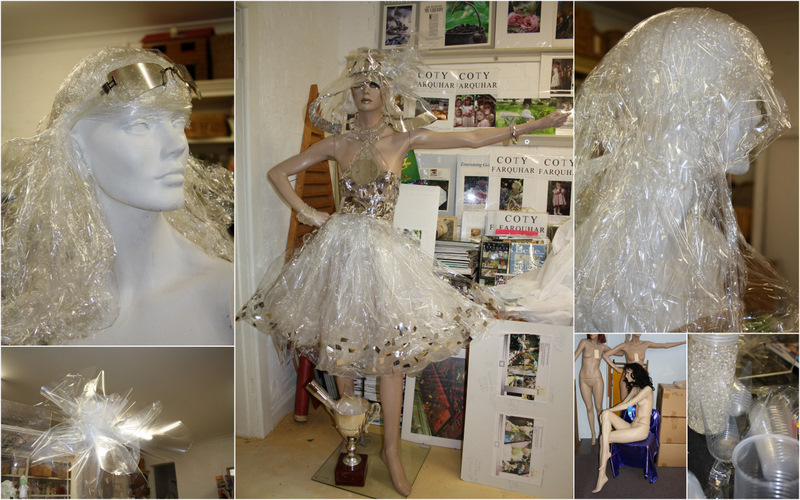 My brief was...Coty...we need to include everything, everyone and all that we do here in the Southern Highlands within one 6 x 6metre stand for a two day event. I had to include hotels, restaurants, our golf courses, Sir Donald Bradman - Cricket, Bong Bong Horse races, dining, wineries, fly fishing, relaxing, entertainment, sports, events and also the many different sponsors and members of SHCE. Wow!! so much to put into one stand. My job was to entice and invite the corporate industry of Australia to head our way....to the Southern Highlands of NSW. 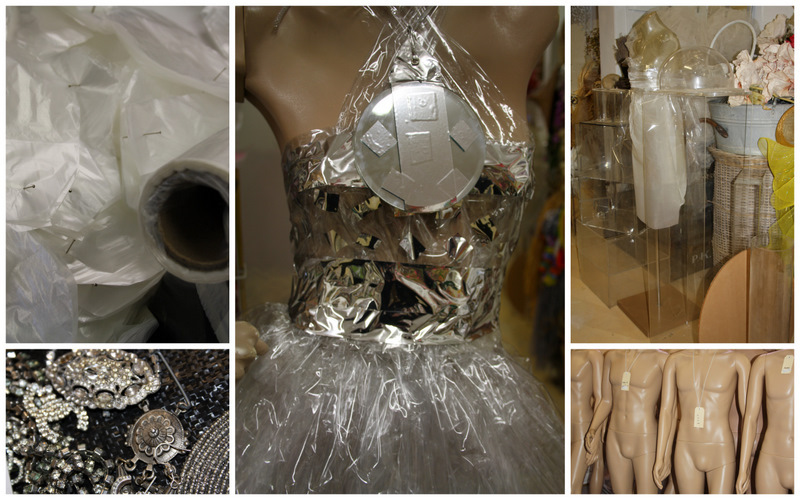 and to of course try and design something completely different!! That was my brief to myself. and a stand that would be remembered years down the track. The stand was larger than last year, but still not that big. I had to include a bar area for wine tastings, a seating area for meetings, a entrance from every angle and it had to flow. 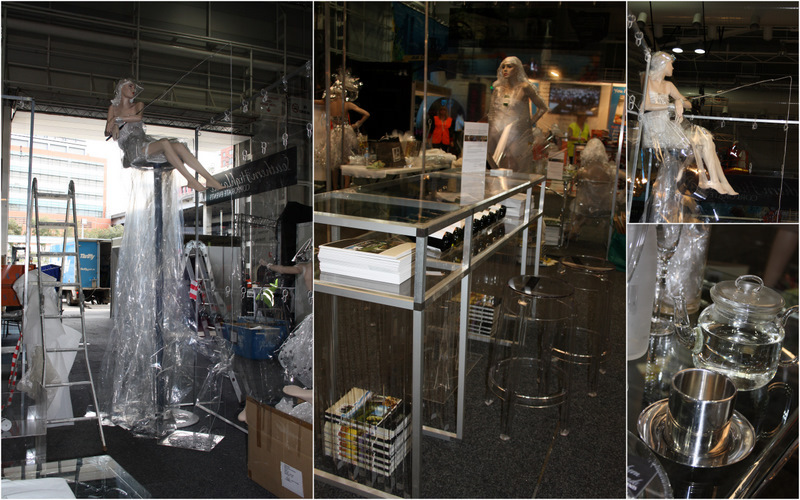 I decided that I would make everything clear, clear perspex walls, clear 'ghost' furniture, a clear bar, clear clothes, clear everything!!! It was completely transparent! Even my flowers were clear. 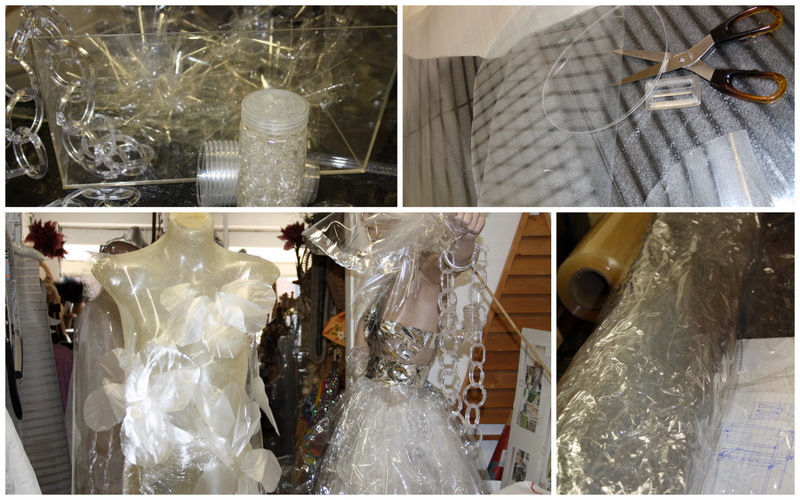 It was great fun making everything out of perspex, cellophane, glad wrap, thick plastics and fabrics. 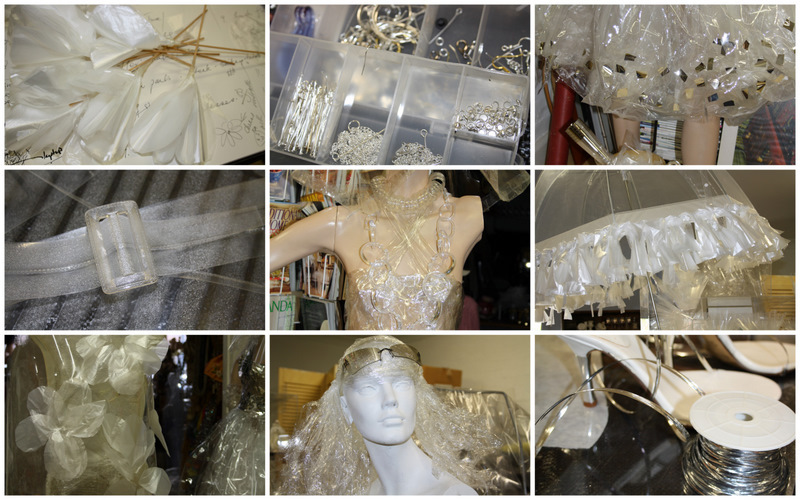 I now have the best collection of clear fabrics in my studio. The only touch of colour was silver. I was amazed at how many wonderful things I found over the months that were clear. 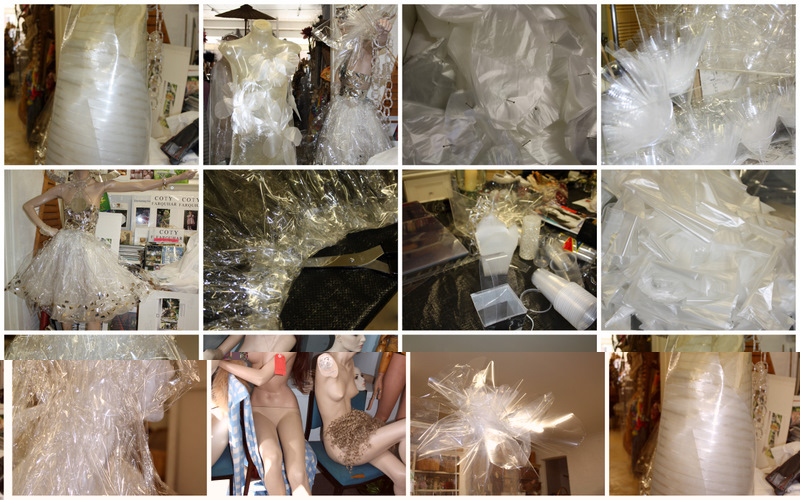 Some of these shots are in my studio showing the making of all the outfits and props and the rest are at Darling Harbour Convention Centre for the installation. Andrew, my beautiful Andrew directed the construction with the help of our apprentice Andy. My Thomas had also planned to be there with us, unfortunately the morning we where leaving for Sydney with all the trucks and cars packed he was taken to hospital, where he stayed on a drip for a week. (Don't worry, he's fine) but I wasn't!! I created little settings through out the stand and of course I had to have my tablescape setting. This I want to share with my favourite table setting party in the USA Tablescape Thursday . 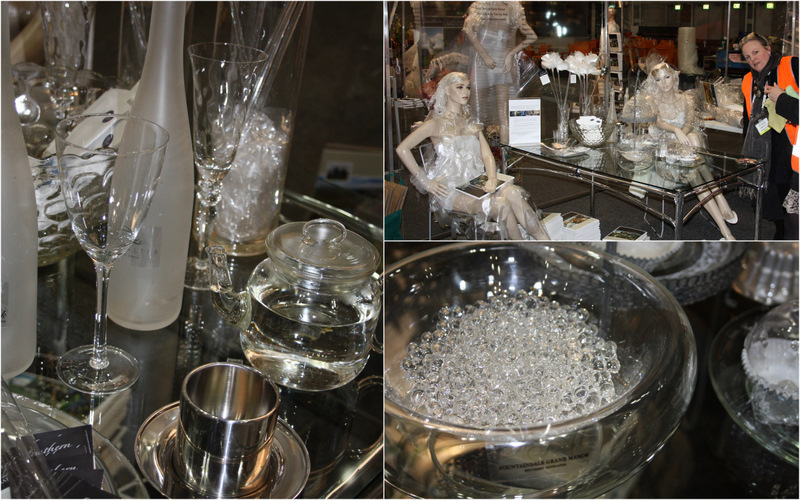 A complete tablesetting with clear food, a glass pudding, clear baby cup cakes, bowls of clear food and more ......all clear. See below, I added frosting over my cakes using very thick clear hair gel and many a visitor was seen dipping their finger into the icing to see what it was!! 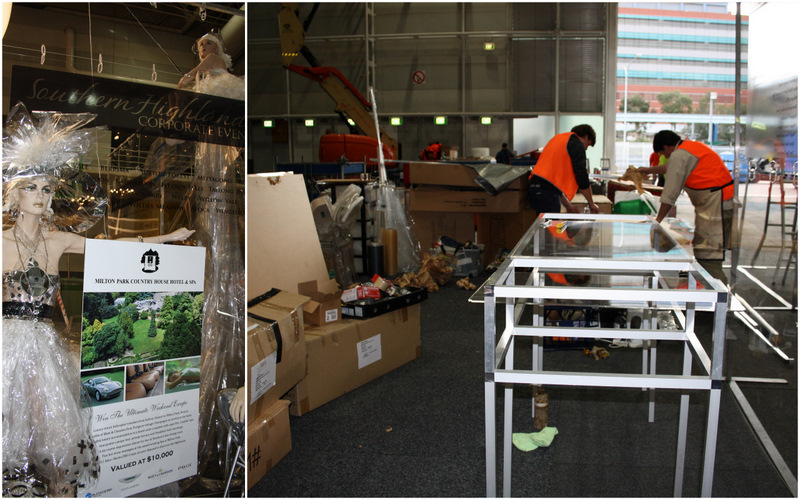 It was actually quite hard to photograph my stand as everything was clear and showed all the stands in the background. What do you think of my beautiful girls fishing? I wish I was fishing today. 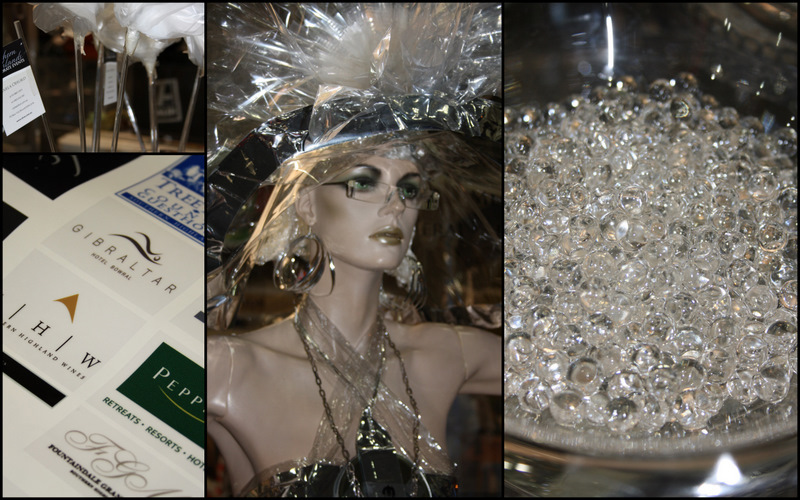 Above: Miss Bong Bong, dressed for the horse races, complete with a clear handbag, clear hat and lots of clear bling!! My great friend Simon Lee from Airstar (see my blog story here) supplied a massive 3metre wide balloon made from soft parachute fabric to which I added my client's logo. 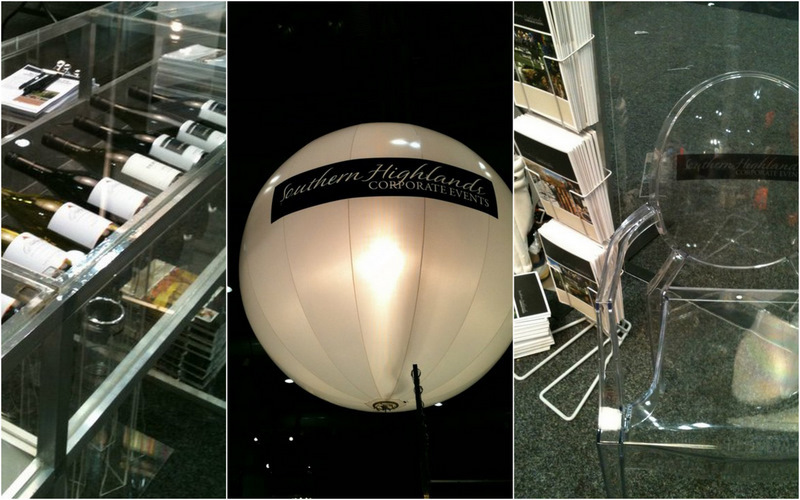 The balloon gave the stand the most wonderful soft light and it could be seen from all over the convention centre. It looked absolutely fantastic, Thank you Simon!! I didn't want little spot lights or wire everywhere on my clear stand so the balloon was perfect and it floated for the two days above my stand. 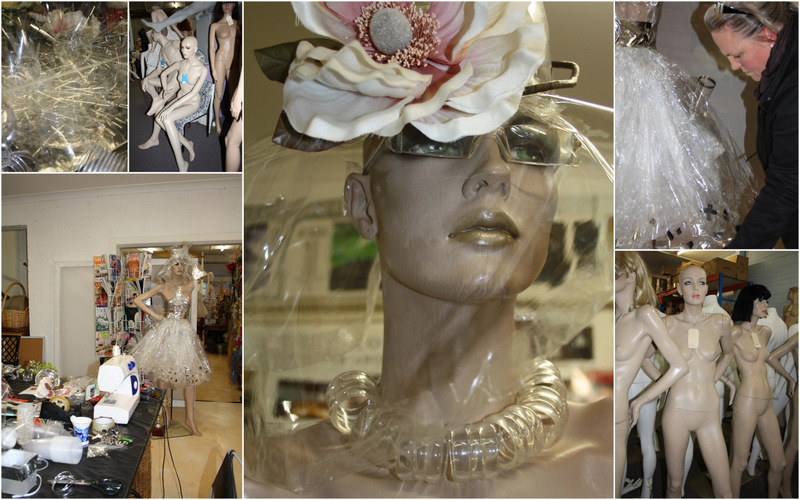 I needed to have characters, mannequins to create my scenes, so once I knew what each person was doing, off I went to Sydney shopping for the right model. 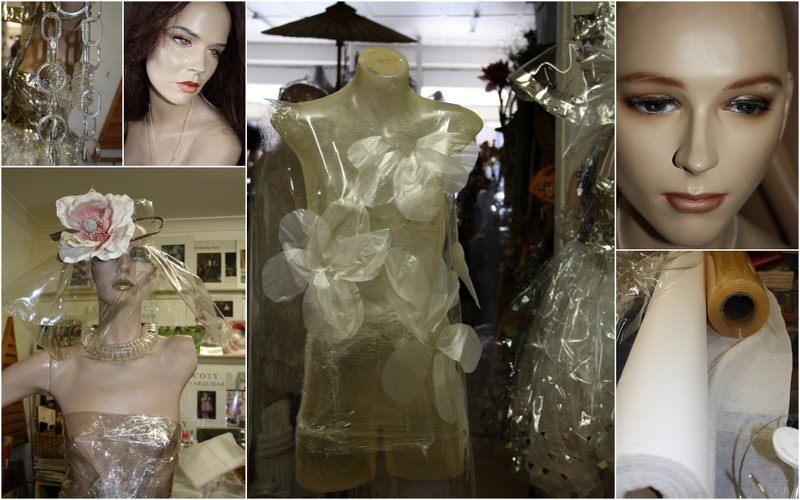 I hired all these great mannequins from Wendy Atkins at Mannequin hire in Sydney. I had six girls and two boys. 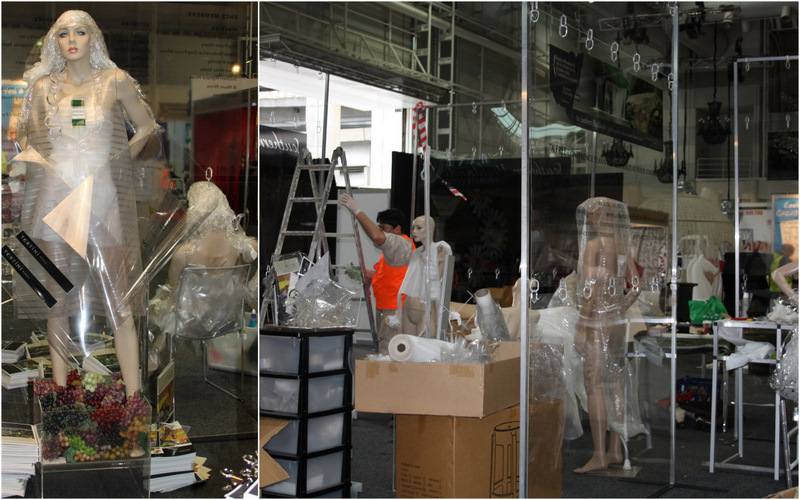 The funniest thing was when I started to unpack the bodies from all the huge boxes it caused havoc with all the tradesmen working at Darling Harbour, there where naked women everywhere, legs, arms, heads and bodies all over the place. It was like a puzzle trying to put them all together. Sixteen different legs in one box, arms in another and body parts everywhere. There was nearly an accident with a fork lift driver as he went past. I did try to cover up the girls as quickly as I could. 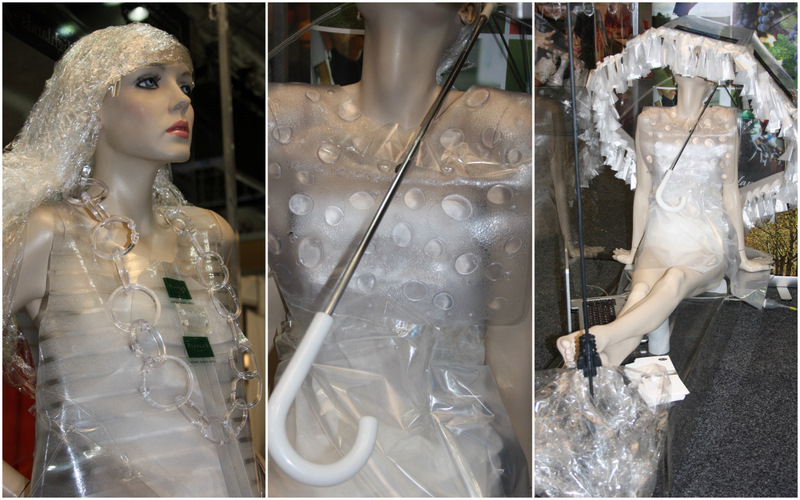 Above: Relaxing under a brolly.....I fringed a clear umbrella with soft plastic and dressed her in the cutest little sundress made from a clear rubber bath mat, complete with bubbles. It was a great success!! 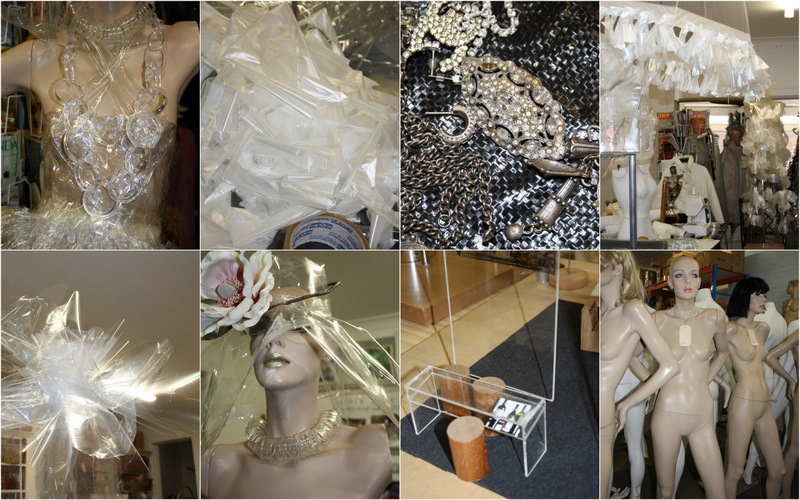 I had so much fun putting it all together and a friend sent me an email/ newsletter from a visitor at the show. 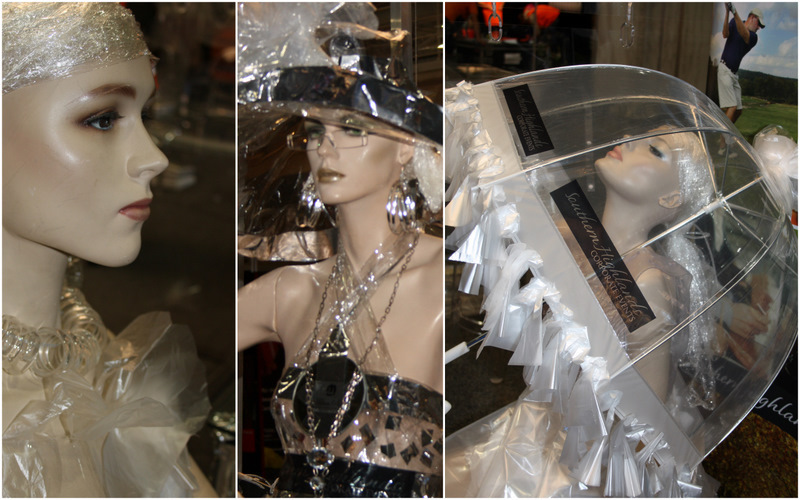 Professional, Swish and the transparent walls made it work from all angles." My job was done, my design worked!! I was completely and utterly exhausted and it was time to head home to my beautiful Southern Highlands. How fun! You are amazing! This is super slick, Coty! I love it! It reminds me...for some odd reason...of a James Bond flick! It just has boldness and intrigue and flair...it is really, really cool!!! Congratulations on placing in the top tier! You obviously put a lot of work and time and thought into this incredible project, and I know your clients had to have been head-over-heels with the results. Congrats, and welcome back to Tablescape Thursday! Coty, I hope you are relaxing and have a bit of self indulgent fun! This display was so stunning and breathtaking. Goodness. Love the balloon idea.. and the mannequins had to cause a scene, they are fabulous.. congrats, this is spectacular on all counts! What a marvelous job Coty. 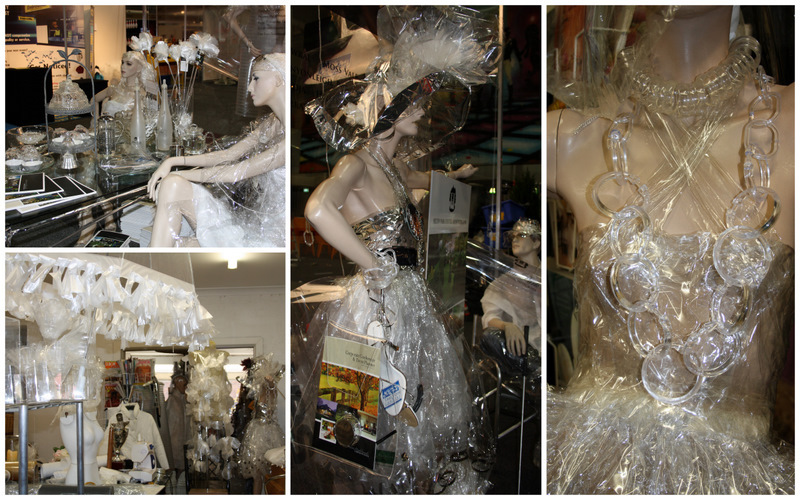 SO uch creativity packed into this space, you deserved the award! Wow! Coty... I am completely stumped ... anywhere close to you and I'd be giving you tons of hugs.I can only imagine how exhauting it must have all been and you created an absolutely stunning setup. YOU ARE AMAZING AND YOU DO AMAZING THINGS!! WELL, I HEARD IT TODAY AND THOUGHT OF YOU.